Select from any of our coffee beans for your monthly coffee subscription. You will have a tough time deciding between our Classic Blend varieties Forte, Espresso Master, Super Crema, or Specialty Blends Mocha Prince, Fair Trade, Decaf, or Premium Reserve, but you don't have to decide - choose Random Variety and we will send you a different coffee each delivery based on the Random Variety schedule. Need more information on how it works? If you choose to purchase the Random Variety subscription, you will receive a different coffee each delivery, but don't worry, you wont receive decaf in the random deliveries. Its just like a magazine subscription and you save up to 30% on your coffee beans with free delivery and a subscription discount. Payments are made by installment, and you can cancel at any time, without any extra cost. If you go on extended holidays, or find yourself with more coffee than you need at any time, just get in touch and we will suspend your coffee subscription at no cost. If you would like to subscribe for yourself, there is nothing more you need to do - we will send your coffee to your address provided at checkout. If you would like to send the coffee subscription to someone else as a gift, you need to let us know the new delivery address of the recipient. Simply email or phone to make a change to the delivery address, or add a comment at checkout "message to merchant", providing the recipients name and delivery address. Your coffee subscription comes with complete flexibility. You can change your selected variety at any time, at no cost, simply by contacting James. Just let him know what variety you would like to change from and to and he will take care of everything. 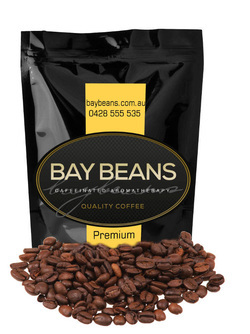 Bay Beans coffee is so much better than anything I can buy locally and the online store is not only very easy to use, but the information about the different choices makes it easy for me to decide which coffee I want. The description along with the 5-bean ratings gives me confidence that I'll get exactly what I like. Fantastic coffee! Love enjoying that beautiful aroma every morning. Looking forward to receiving our coffee every month. What did i find on my doorstep this morning, my beans already - super quick as always (even with Australia post). The smell when I opened the parcel was divine (and a welcome pick me up after a very early start with the kids today) - thanks! Thanks heaps, James. After your beans, I'm ne'er going back to Gloria Jeans- they taste so tasteless now! Having bought beans on-line for years and watching the prices for product and shipping creep higher and higher with every order, we were getting worried. Finding James roasting high quality coffee beans (especially the Brazilian) in our neighborhood was like a gift from coffee heaven. The selection, the competitive cost, and best of all roast-day delivery ensures we are supplied with the freshest products at the best price in NSW. You ROCK James! You can cancel or suspend your coffee club subscription at any time, without penalty. You can contact us and we will take care of everything, or you can manage your subscription by using the button below.